When Twilio receives an incoming SMS or MMS, you can direct it to make a request to a Webhook. A Webhook is merely an endpoint that you create – when Twilio receives messages on specific numbers, we will look at your endpoint for further instructions using our TwiML markup language. Our example code uses the Twilio Python Helper Library and The Flask Python Microframework to both respond to Twilio’s Webhook requests with TwiML and to call Particle’s easy-to-use Functions which will hail our Electron. # We're only going to take the first 63 characters, warn them. "We can only handle 63 maximum characters.  " # Awesome! Full Morse code coming up. "We'll make it - ahem, blink it - so!" You can see that we use the Particle Cloud REST API to send a String to the device, which will eventually be converted into a series of dots and dashes. First, clone our repository, then enter the directory. You’ll probably want to create a virtual environment for Python 3 . We help you with that in this document. In the file ‘environmental.py’ we show the three environment variables you need to set to get our Flask application to run. You can find these in Particle’s Web IDE. PARTICLE_TOKEN – This can be found in the ‘Settings’ tab, demarcated by the Gear icon, under ‘ACCESS TOKEN’. PARTICLE_DEVICE – This is the friendly name of the Electron to flash, found in the ‘Devices’ tab of the Web IDE. 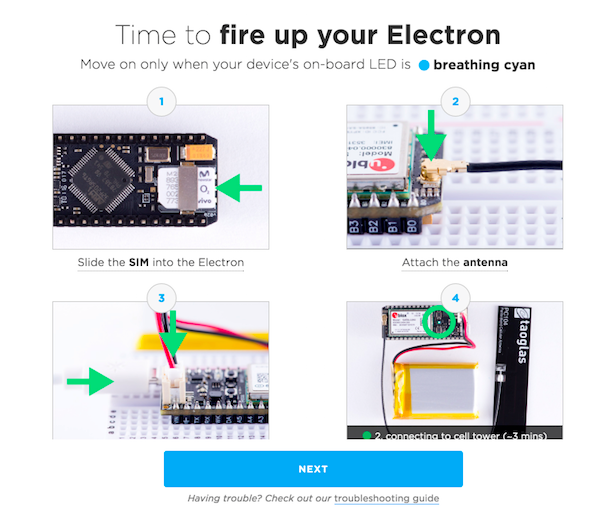 PARTICLE_FUNCTION – This is the function to call through the Particle Cloud REST API; we use ‘led’ by default in our firmware. And that’s it for the server! 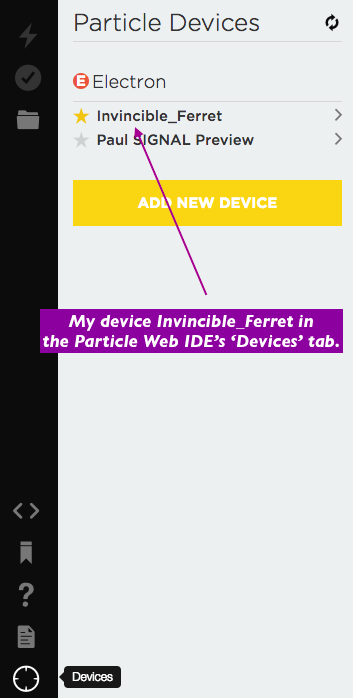 Particle’s Web IDE makes it very easy to share device firmware – all you’ll need to do is, while logged in, click this link. Click the big ‘Copy This App’ code to load it into your own IDE. After that, Flash it with the ‘Lightning’ icon! As for timing, we have defined some defaults in the ‘MorseHelper.h’ file. Each of these #defines is a millisecond delay; feel free to change them in your own code to better suit your own Morse Code needs. The rest of the code is commented for your casual perusal – if you’d like help with any of the logic, feel free to ask us here how we’re doing that voodoo that we do! And with that, you’ve got a Particle Electron which responds intelligently to Twilio-powered SMS and MMS messages. Whether you’re going to use our example to reenact the Morse-code scene from Independence Day or build something more… ahem… modern, we hope this gives you a good base. S-O-S with Twilio and the Particle Electron! With a Particle Electron and Incoming Text Message handling with Twilio, we know you’re going to do big things. Promise to come back when you do – we can’t wait to see what you build.